We are midway through the 2015 AFL Season.Games have been won and lost, coaches have been sacked, players have been injured, outed, suspended and retired, and AFL has been a constant feature of the media headlines. closely contested, others not so much so. A diverse cluster of teams are clinging to top spot, embracing the middle rungs, or languishing on the bottom of the AFL ladder. 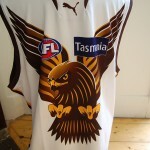 A constant through all this, balanced precariously on the slippery slope of your teams performance remains the humble footy jumper, jersey, guernsey. This singular piece of clothing is able to galvanise fans, direct loyalty and rouse the most placid of fans to a a fever pitch of excitement, when revealed on game day. 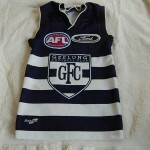 Such an iconic part of the Aussie psyche, the humble footy jumper is worn, not only on match day,but all year round. 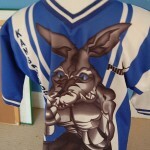 It goes to the beach, the bbq, the school fundraiser, the pub and the footy. Its distinctive colours invite interest from even the most passive of spectators . 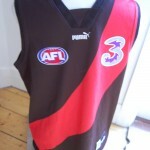 The AFL footy jumper, jersey, guernsey , its a dead set legend. Its round 18 , in the AFL 2014 Home and Away Season . 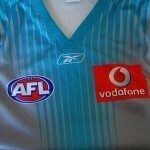 By now , beleaguered fans will know if their club will be in the Finals . Many have endured a season of winter chills , highlights , and disappointments . It is at this stage of the season that retirements are announced , players struggle to find form to retain their place in the team , and coaches are under pressure to deliver a finals appearance . 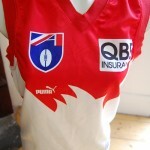 The ever evolving , football jumper , jersey , guernsey has changed too . What was once a humble piece of apparel , used to brand and identify players and supporters alike ,it has morphed into a slick , aerodynamic ,piece with colourful , graphic designs , and sponsors logos sublimated on them . are making a comeback . Collingwood Football Club have released a range of retro football guernseys , sporting the old blue and white VFL logo patch , and peak collar . 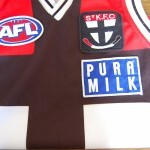 Whilst they are not a departure from their traditional black and white iconic strip , the retro jumper , was touted as a possible mothers day gift . 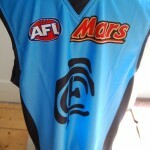 CFC keen to make a buck have appealed to fans to purchase one for Mum . 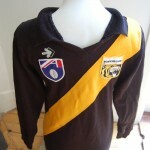 Apparently these were the jumpers the Mums saw on the footy fields , before they became Mums ! 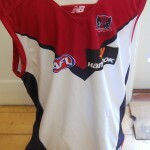 Melbourne FC played the Western Bulldogs on Sunday in their traditional navy blue football guernsey , but the red yoke and trims , were replaced with bright pink and printed with lighter pink figures of women, to raise awareness of breast cancer . Some teams had a bye at the weekend , others played , and the Swans beat the Hawks in Sydney , proving the Hawks aren't unbeatable .An extended round of matches has been played out , commencing on friday and finishing on monday night when the Saints play the Blues . Both teams are desperate for a win , being in 13th and 15th spot respectively , on the ladder and could be described as evenly matched . They have shared a great rivalry over the years , and this game promises some jumper tearing action for fans .